Ridley Scott Confirms 'PROMETHEUS 2' is his Next Movie! Ridley Scott in a recent interview with Empire confirmed that his next project is a sequel to Prometheus! While discussing his most recent movie The Martian the 78 year old replied to Martian star Matt Damon's joke that "Ridley was done with the movie about two weeks after we shot" stated "I was starting to look for locations for my next movie, which was Prometheus 2." The 2012 pseudo-prequel to the Alien franchise Prometheus was released in May 2012, & starred Noomi Rapace, Michael Fassbender, Charlize Theron & Idris Elba. It went on to earn $403 million worldwide. The movie is yet to be officially announced by 20th Century Fox, but is has been suggested that it may begin production in January, 2016. 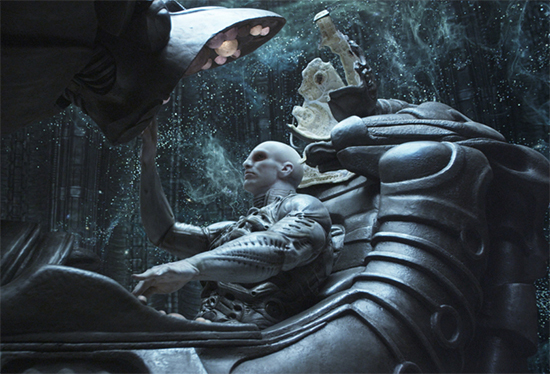 I'm reading: Ridley Scott Confirms 'PROMETHEUS 2' is his Next Movie!Tweet this!